Boyle Yer Stotts are back with their brand new cockle warming, side splitting, belly hurting, bum twitching show “Everywhere We go”. In 2015 South Shields FC were suffering dark times, they had lost their ground and were now playing 22 miles away at Peterlee, to a handful of hardened supporters and not knowing what the future might hold for this once great football club. Just as everything was looking bleak, a knight in shining armour came to the rescue. 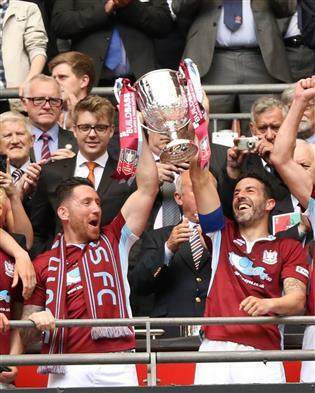 The club were brought back home to Mariners Park and have never looked back! The crowds grew in size as the club began to pick up trophies and win back to back promotions, all culminating in THAT historic day at Wembley. 15,000 South Shields fans travelled down to the capital to watch South Shields FC v Cleethorpes Town on 21st May 2017. The fans took over Covent Garden the night before and then enjoyed “Saveloy dips on Wembley Way”, before witnessing South Shields FC win 4-0 and make history by lifting the FA Vase in the home of football. Making it a day the town will never forget and will be one that will be looked upon fondly for years to come. Join Boyle Yer Stotts in this epic journey of triumph over adversity. “Everywhere We Go” guarantees to be a laugh out loud night, full of memories (George and his little trip down those famous Wembley steps…You can take the lad out of Shields…) and stories from what has been a brilliant few years for the club and our beautiful town. We’ll even make sure George gets a front row seat so there’s no more accidents with stairs. Told from a fans point of view by people who were there. Book early to avoid disappointment. This is a show you don’t want to miss.